Eileen Flanagan explores the lessons she learned in the process of finding a partner and deciding to marry. 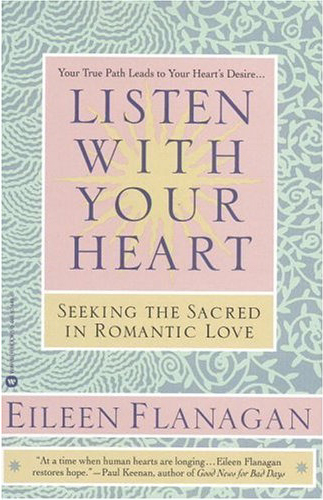 Drawing on original personal interviews, Listen with Your Heart: Seeking the Sacred in Romantic Love shows how loneliness and fear offer opportunities for spiritual growth, how listening to your inner voice can bring peace and clarity, and how romantic love can be a spiritual path. Ms. Flanagan’s book is a refreshing change…it offers hope and a depth of guidance seldom seen. Flanagan takes a uniquely spiritual view of ‘finding the path that will unleash the great love within us.’ She…offers a gentle, comforting alternative to ‘shopping’ for a partner. At a time when human hearts are longing…Eileen Flanagan restores hope. An exquisite reminder that love is far more grace than commodity.